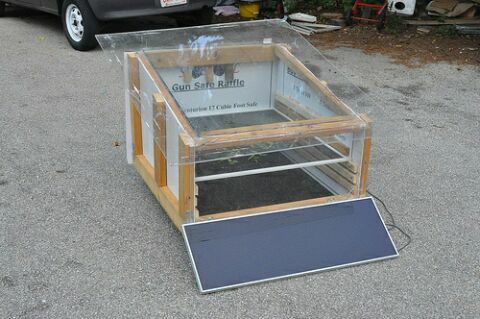 One of our forum members, Ben Nelson, just built a solar powered food dehydrator. 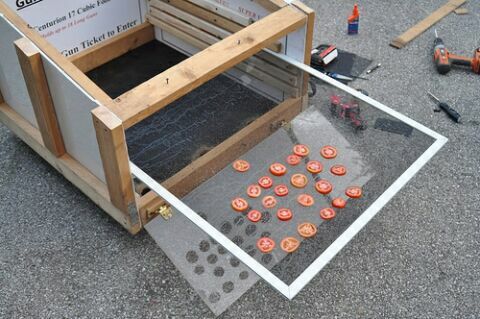 He decided to make the dehydrator after joining the local CSA (Community Supported Agriculture) program. The CSA supplies locally grown food that is in season. The problem with it is you can end up with a whole lot of the same type of food and not enough time to eat it all. So, Ben plans on using the dehydrator instead of freezing and canning to preserve his locally grown food. All of the materials used to build the dehydrator are recycled from things Ben already had. He made the frame out of scrap 2x4s. The white paneling is foam core board recycled from a sign. The glass piece on the top is from a thermal pane window that a friend was scrapping. The screens, used as trays, are from the same windows. The actual dehydrating is helped by two salvaged computer fans. The fans are run off of a 12V battery that is charged by the solar panel shown in the picture. During the day, the sun charges the battery and heats up the box to speed the dehydrating process. During the night the fans continue to run off of the battery. Ben says the dehydrator works pretty good. All you need to do is prepare the food, throw it in the dehydrator, wait a couple of days and take it out. So far he has done tomatoes, basil, apples, pears, and peppers. For more info on the dehydrator, check out Ben’s forum thread about it.